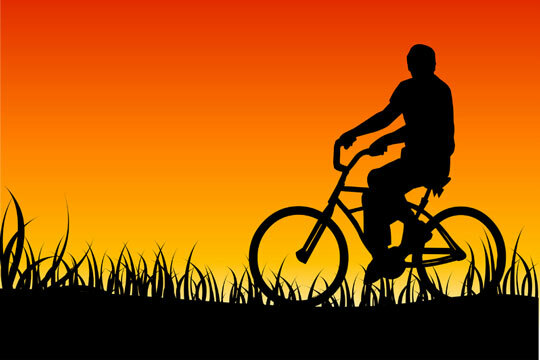 The bicycle is a two-wheeled, steerable vehicle that is propelled by its rider. 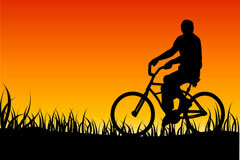 Cycling is the use of a bicycle for transportation, sport, or recreation. Forms of cycling include mountain biking, road cycling, and bicycle racing of various kinds. Although motor vehicles have largely supplanted bicycles for general transportation purposes, interest in cycling has revived in recent years as people have become more fitness conscious and environmentally aware. The basic elements of today's bicycle were developed in the 19th century, over a span of several decades. In 1817, Baron Karl Friedrich Drais von Sauerbronn patented a wood-framed, steerable vehicle with two wheels, which he called the draisine. Propelled by the rider's feet scooting along the ground, this vehicle spawned the development of many similar machines, known as dandy-horses. In 1839, a primitive bicycle, featuring treadles that propelled the rear wheel, was invented by Scotsman Kirkpatrick Macmillan, and in 1845, Englishman Robert William Thompson patented a "hollow, air-filled tube," the first attempt at creating a pneumatic tire. In 1861, French coach builder Pierre Michaux invented the velocipede, which was essentially a dandy-horse with cranks and pedals attached to its front wheel. Velocipedes became popular in Europe, and in 1866, former Michaux employee Pierre Lallemet patented the velocipede in America. In 1869, the first recorded velocipede race was held in Paris, and larger front wheel sizes were developed in order to achieve higher cycling speeds. This led to the development of the unstable, but fast penny-farthing bicycle, with its very large front wheel and very small rear wheel. The penny-farthing's top speed was limited, however, because its front wheel diameter was limited by the length of its rider's leg! In 1885, Englishman James Starley invented the Rover safety bicycle which featured a diamond-shaped frame as well as pedals and a chain drive that propelled the rear wheel. 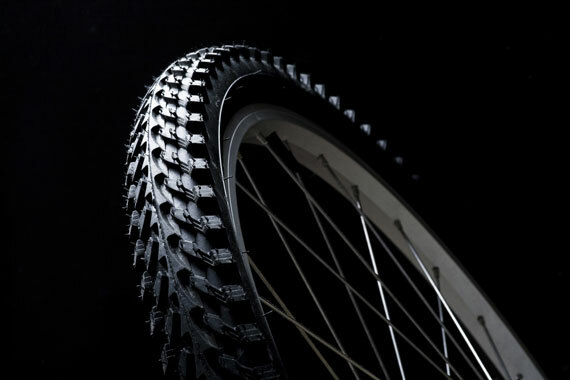 Two years later, Scotsman John Boyd Dunlop developed the first practical pneumatic bicycle tire. Key elements of today's bicycle were now in place, the modern bicycle industry was born, and the bicycle's popularity exploded. Further refinements such as seat posts, coaster brakes, freewheels, and derailleurs, quickly followed in the 1890s, the Golden Age of Bicycles. USA Cycling is the official United State cycling organization, and their website is a good resource for those wishing to learn more about this exciting sport. The Science of Cycling features an excellent photo and video essay on how bicycles and their components are designed to efficiently interact with their riders. We also encourage you to visit the resources listed below, which provide a wealth of information about bicycle equipment and accessories and their suppliers. Learn about bicycle gear and cycling apparel, and find bicycle accessory manufacturers. Bicycle part and bicycle component guide and supplier directory. Find a broad selection of online bicycle shops and cycling resources. Learn about BMX bikes, mountain bikes, and road bikes as well as cyling organizations. Learn how to choose a good bike shop, and browse through the local bicycle shop directory. Find bicycle dealers and repair shops located in every state of the USA. Guide to bicycle transport racks and storage racks, and bike rack manufacturer directory. Directory of selected bicycle tour providers and resources. Browse for bike tours and cycling adventures. Guide to exercise bicycles, stationary bikes, and home exercise equipment. Aggregated bicycle-related news, in the form of news headlines, summaries, and article references from multiple news sources. An overview of recreational cycling and several cycling-themed videos can be found on this page.